WYSIWYG editors revolutionized content management systems, will WYSIWYC interfaces do the same for laser cutters? Unlikely, but we still appreciate the concepts shown here. Chalkaat uses computer vision to trace lines drawn in ink with the cutting power of a laser. At its core, you simply draw on your work piece with a colored marker and the camera system will ensure the laser traces this line exactly. There is even a proof of concept here for different behavior based on different line color, and the technique is not limited to white paper but can also identify and cut printed materials. This is a spin on [Anirudh’s] first version which used computer vision with a projector to create a virtual interface for a laser cutter. This time around we can think of a few different uses for this. The obvious is the ability for anyone to use a laser cutter by drawing their designs by hand. Imagine introducing grade-school children to this type of technology by having them draw paper puppets and scenery in advance and have it cut in shop class for use in art projects. A red arrow indicates cut line, but a pink arrow is used for indicating positioning on a work piece. The example shows a design from a cellphone etched next to a positioning marker. But we could see this used to position expensive things (like a Macbook) for etching. We also think the red marker could be used to make slight adjustments to cut pieces by scribing a work piece with the marker and having the laser cut it away. This concept is a product of [Nitesh Kadyan] and [Anirudh Sharma] at the Fluid Interfaces group at the MIT Media Lab and is something we could see being built into future laser cutter models. What do you think? The Dyskograf lets you make music with a magic marker. The musical installation looks much like a turntable for playing vinyl records. But instead of a spiraling groove containing the sounds, this uses marks on a paper disk to play sound samples. You can see the light outline of several tracks on the paper disc shown above. By adding black marks the optical input of the Dyskograf knows when to start and end each sound. This is best illustrated in the video demonstration after the break. The marker-based setup makes a lot of sense, and we think it would be perfect if the disc was a dry-erase board. It certainly makes it a lot easier to lay down new beats than this other optical turntable which required holes to be drilled in a vinyl record to play the sounds. While we’re on the topic you may also find this coin-based turntable sequencer of interest. In an effort to be more relevant to children that just aren’t impressed with crayons and markers anymore, Crayola released the ColorStudio HD pen. Instead of ink, this pen is filled with electronics that communicate with a tablet to draw different colors in the Crayola ColorStudio app. [Rob Hemsley] had done some work with capacitive touch screens before, so when he heard the clicking of a tiny relay inside the pen, he automatically knew how it worked. Of course this meant tearing apart the Crayola marker to look at the electronics, but [Rob] also went so far as to replace the microcontroller, allowing you to craft your own ColorStudio HD pen. The digital Crayola marker communicates with the app by switching a relay on and off very quickly. This completes a circuit between the user’s hand and the touch screen, allowing the tablet to interpret the desired color by measuring how many touches are received per second. Inside the pen, [Rob] found an RGB LED, a relay, and a PIC microcontroller. Not having any experience with PICs, [Rob] changed out the ‘micro to an ATtiny44 and started writing some firmware with the help of the Arduino IDE. [Rob]’s updated version functions exactly like the stock version, communicating with the Crayola app by pulsing the relay to indicate the selected color. Even though the Crayola app only has three possible colors, [Rob] says it’s feasible to program the digital pen to send an RGB color value to a tablet, allowing you to choose what color to draw with on the pen. You can see a video of [Rob]’s updated pen after the break. This center pivot pen plotter is an interesting take on the idea, and manages to somewhat simplify the fabrication when compared to a gantry-style built. Normally we’d see a gantry that travels on two rails, with a print head that moves along its length. Here the gantry is anchored on just one side, with a chain driven system to rotate it along the plotting surface. The print head uses a fine-point felt-tipped marker. It still travels along the arm as you would expect, and can be tilted away from the paper for repositioning. What was made easier in hardware ends up adding to software complexity. The benefit of a traditional system is that it uses X and Y coordinates to plot a design. The pivot of this mechanism means that as the print head moves further from the center of the machine, the distance between each pixel is magnified. But the clip after the break proves that this issue has been solved. Whether you know it as a clapperboard, a slate, slate board, time slate, or by another name, you probably recognize this staple of movie making. It’s a handy way to help synchronize sound with video, and to keep track of clips when it comes time to edit. But this clapperboard is quite a bit more accurate than most. It’s got an atomic clock source for dead-on accuracy. 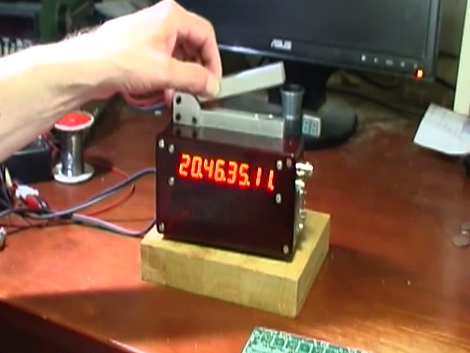 The project came from the growing availability of Rubidium clock source modules on eBay. They can be had for under $100 and you’ll enjoy accuracy of 0.1 ppm. [Luddite Tech] grabbed one for himself and included it in this build. As you can see in the clip after the break, the contrast of the eight-digit display is adjustable, and shines brightest when the marker is snapped. We’d guess the cable he connects at the beginning of the demo is used to set the initial time reference. After that the in-built WiFi can be used to push the time markers to a computer.